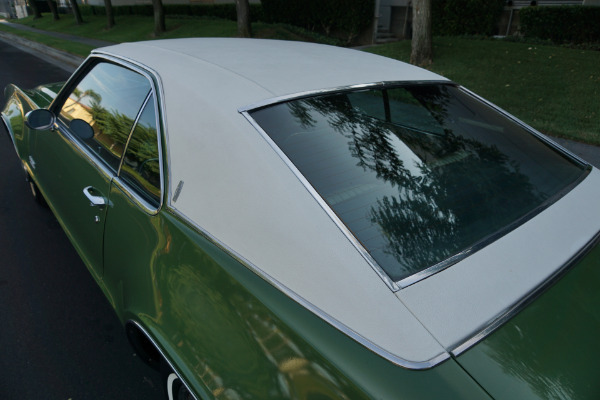 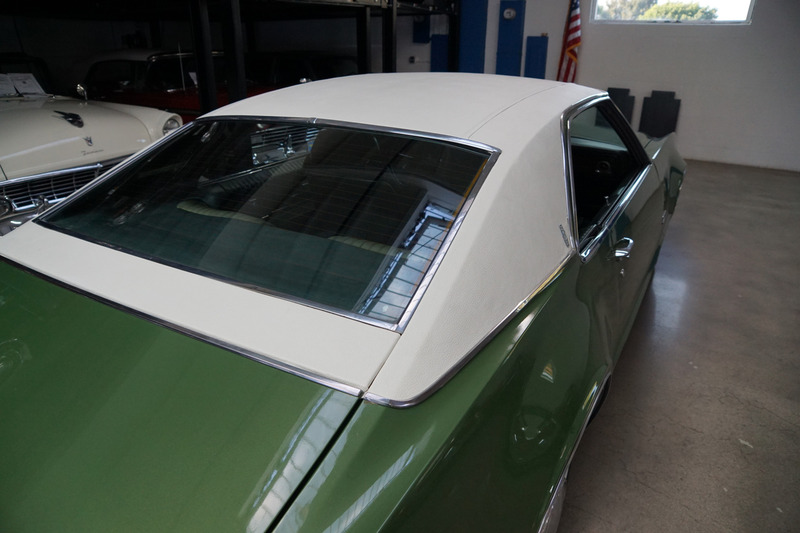 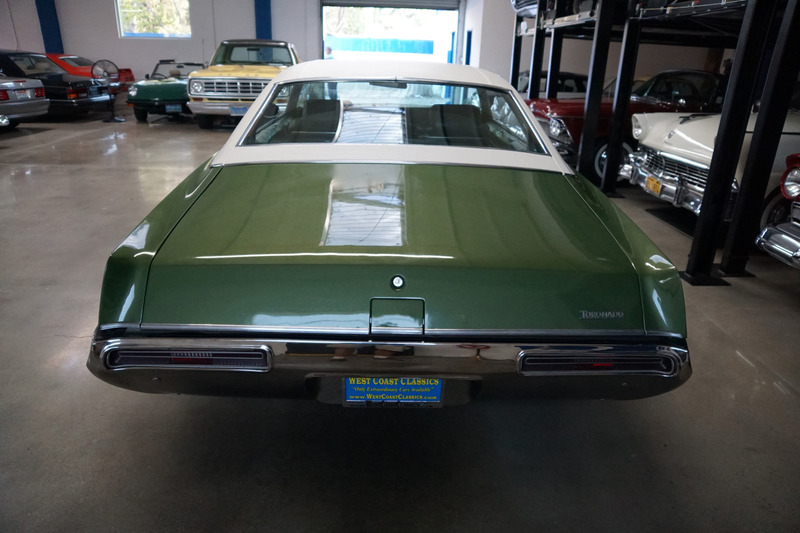 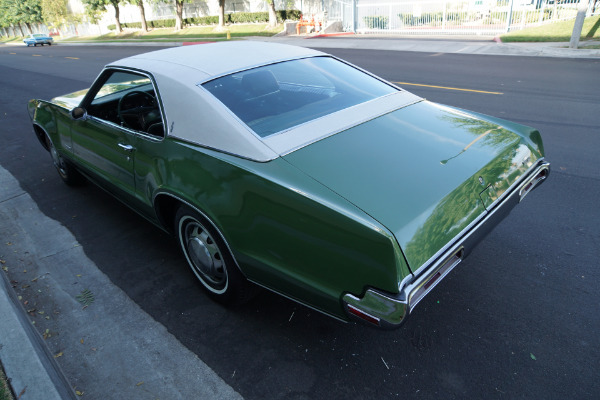 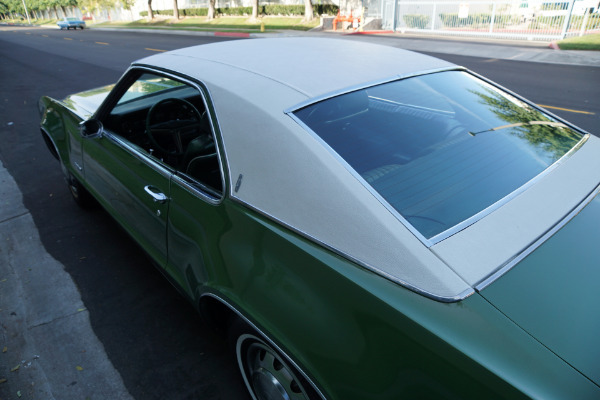 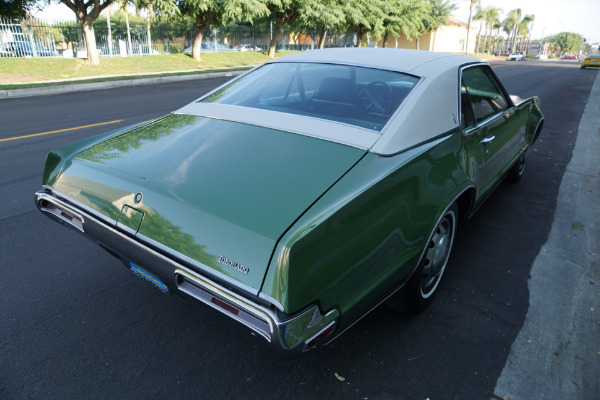 Finished in it's original factory 'Ming Jade Green Metallic' color paint (Paint Code 46) with a matching 'Green Cloth & Vinyl Strato Bench Seat' interior, a factory ordered 'White' vinyl top and with it's original wheels and hubcaps. 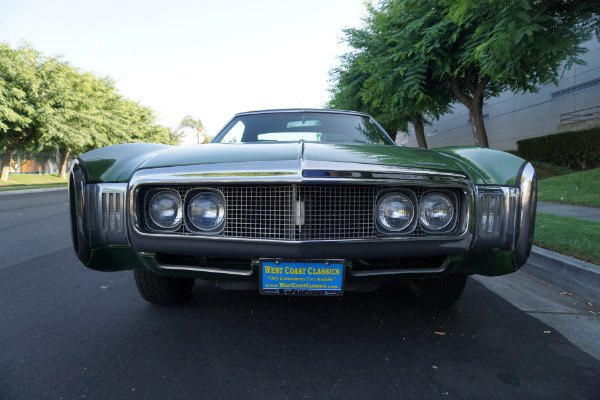 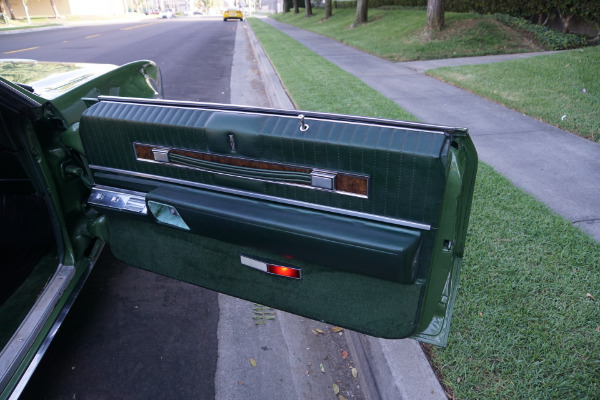 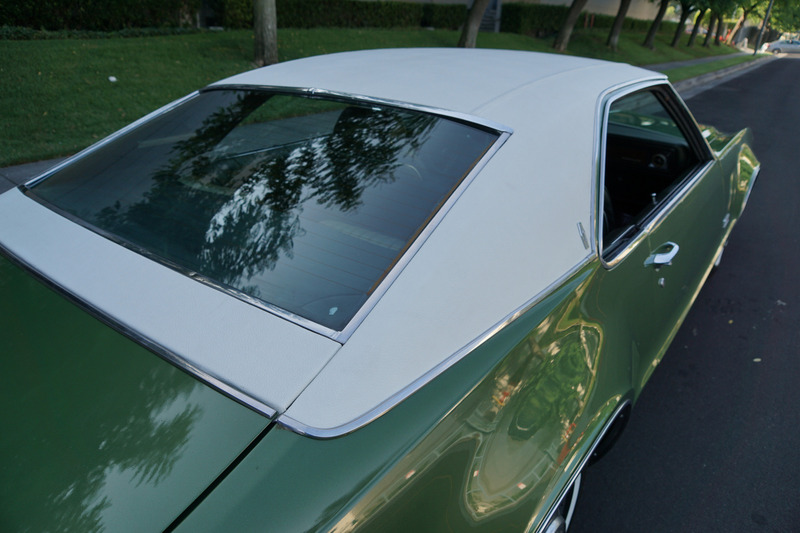 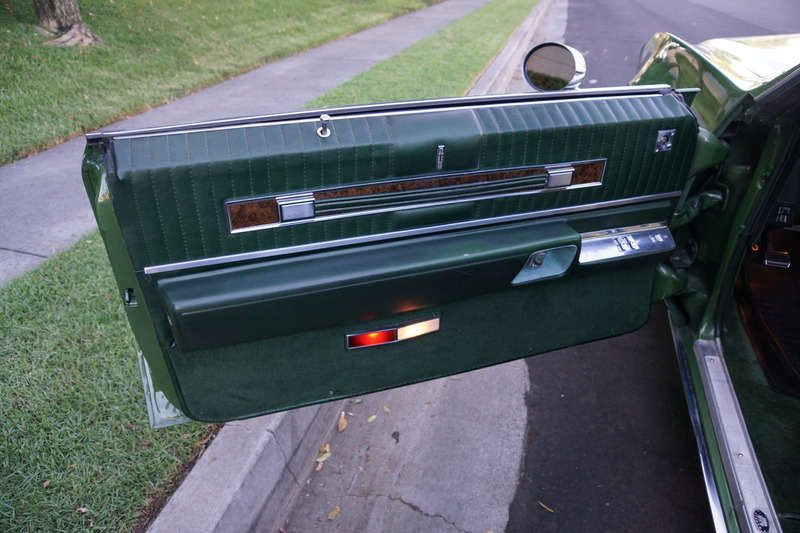 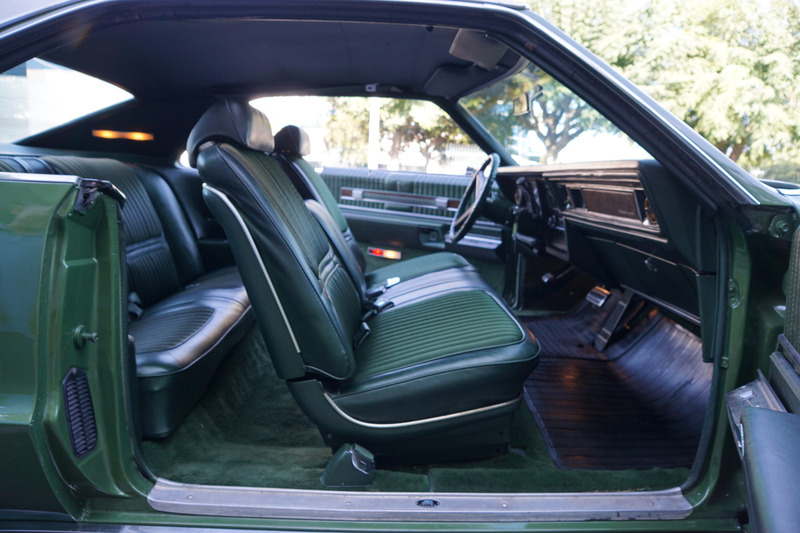 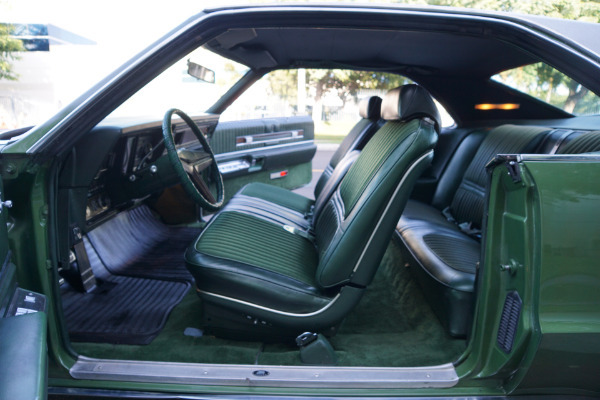 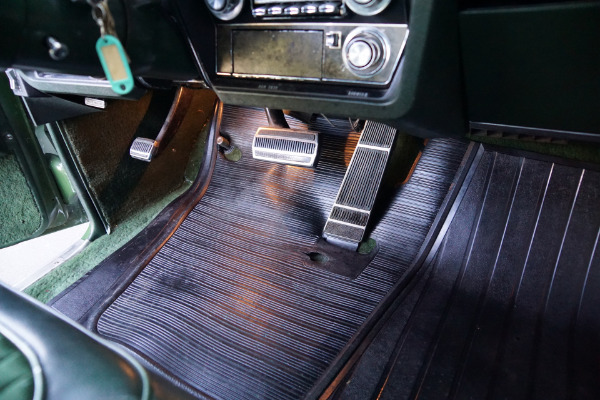 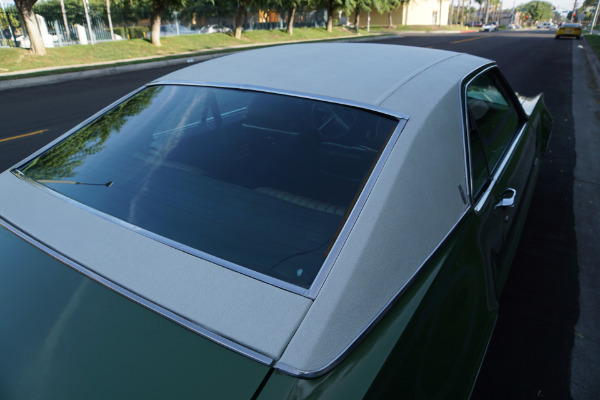 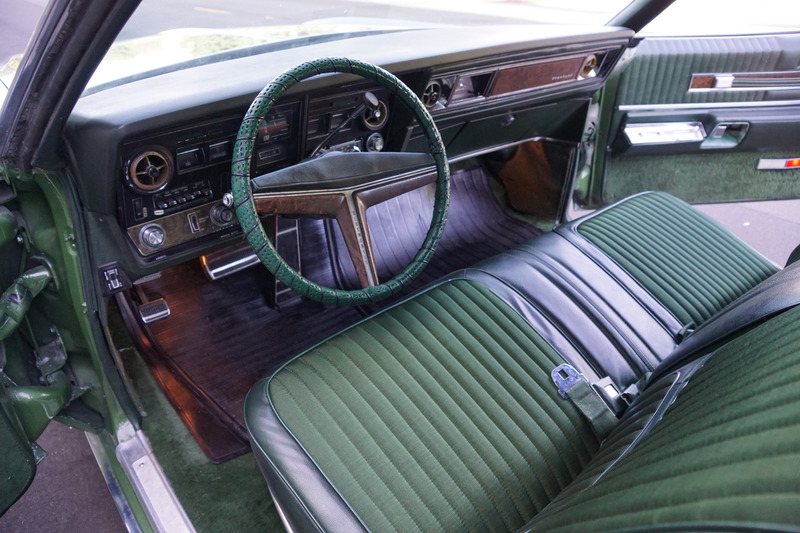 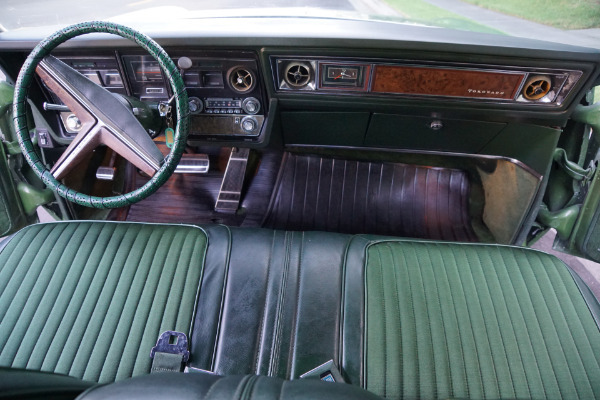 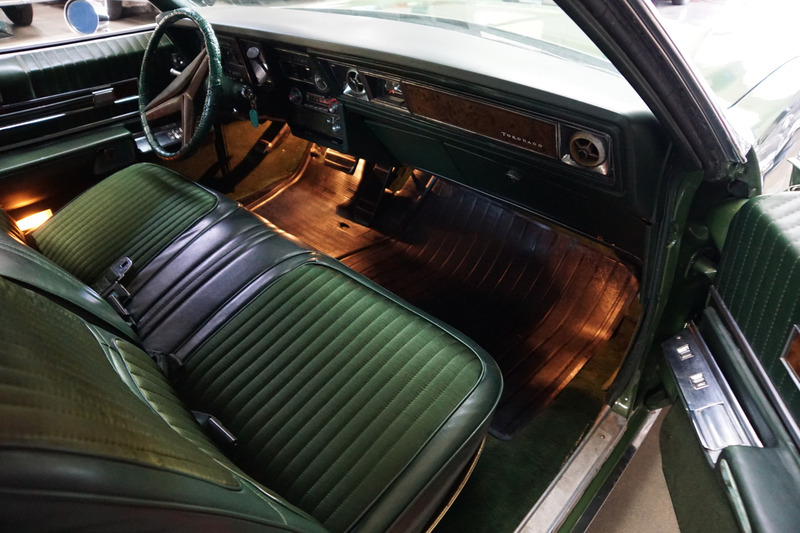 In 1969 the Toronado Custom interiors were a popular option, providing amenities the standard interior didn't offer, such as full-length door armrests with built-in provisions for the optional power windows and door locks controls. 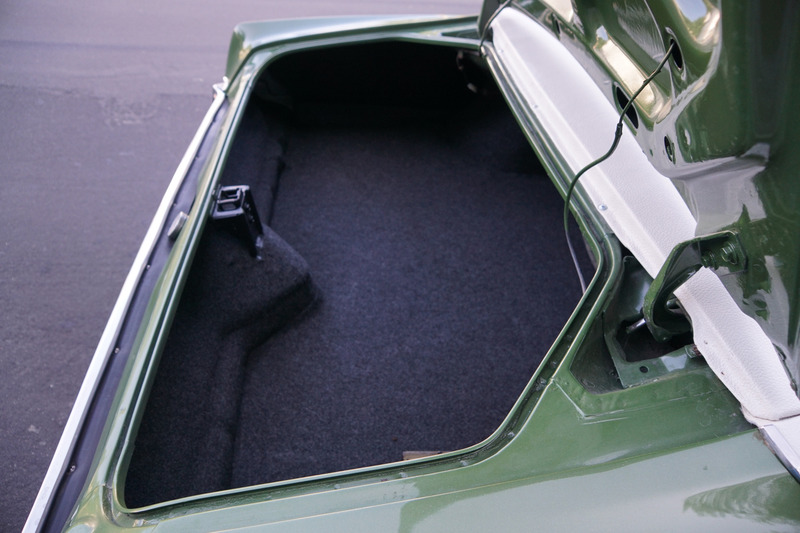 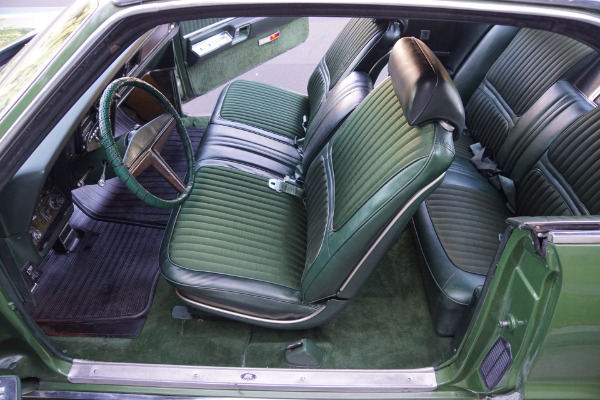 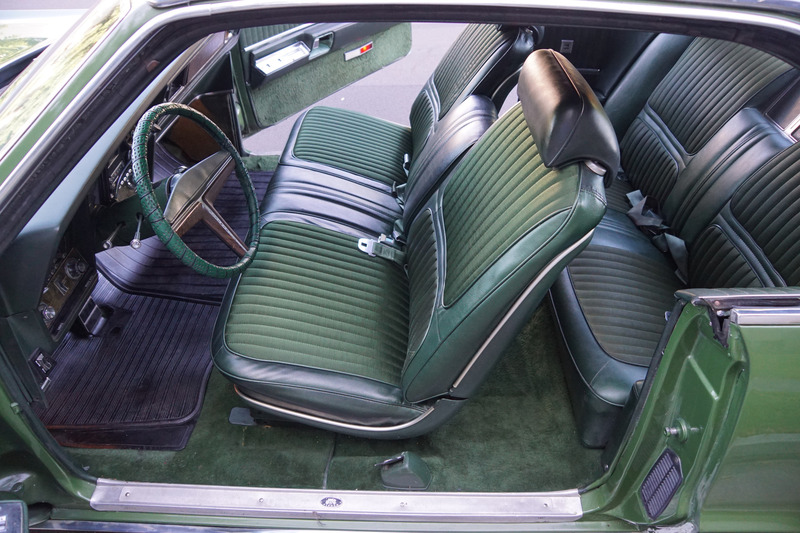 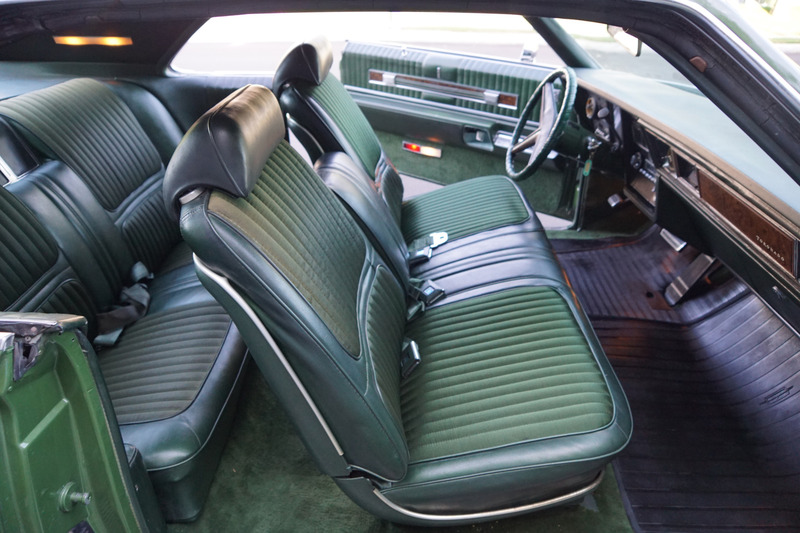 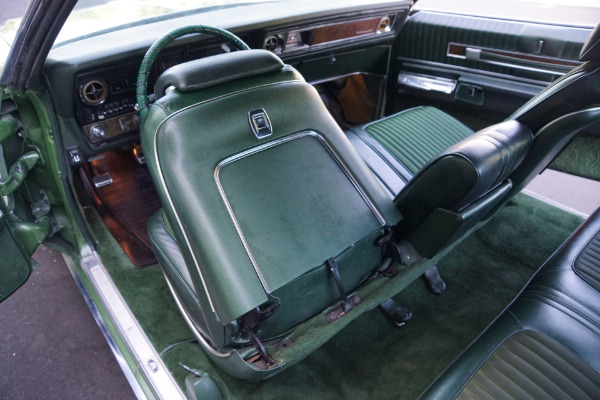 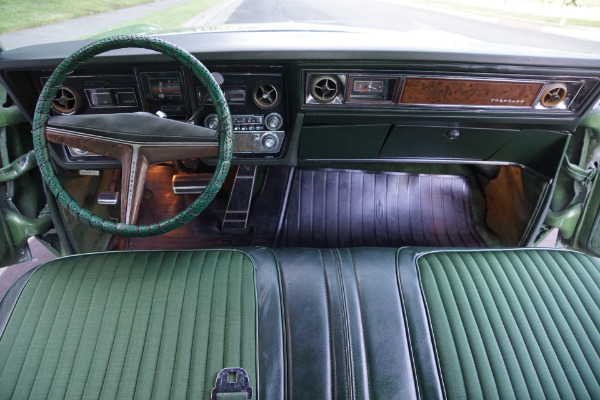 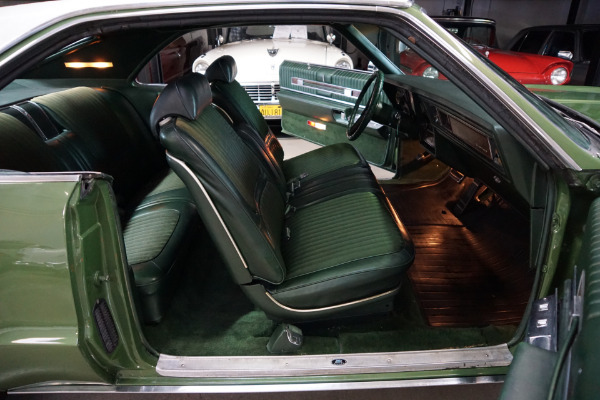 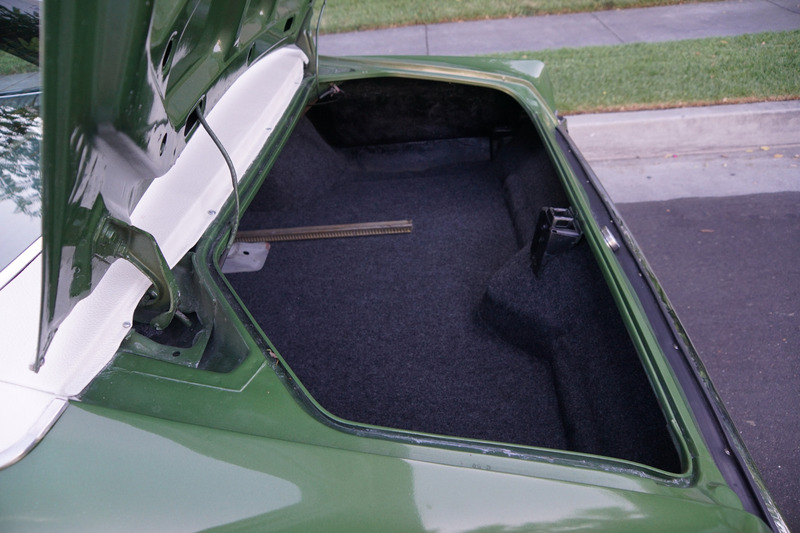 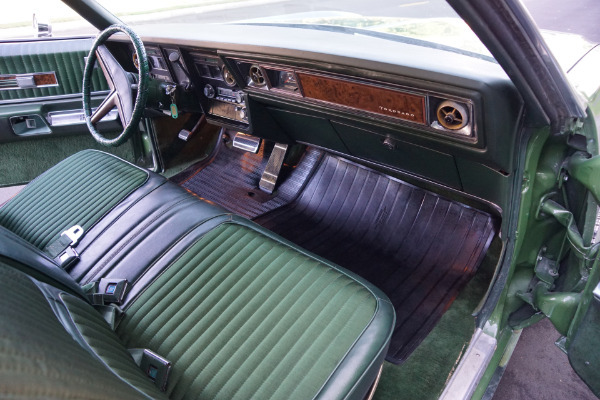 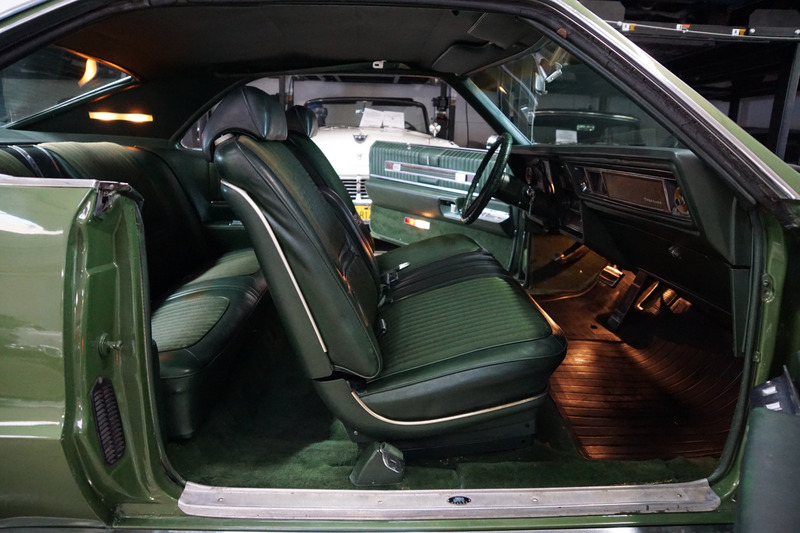 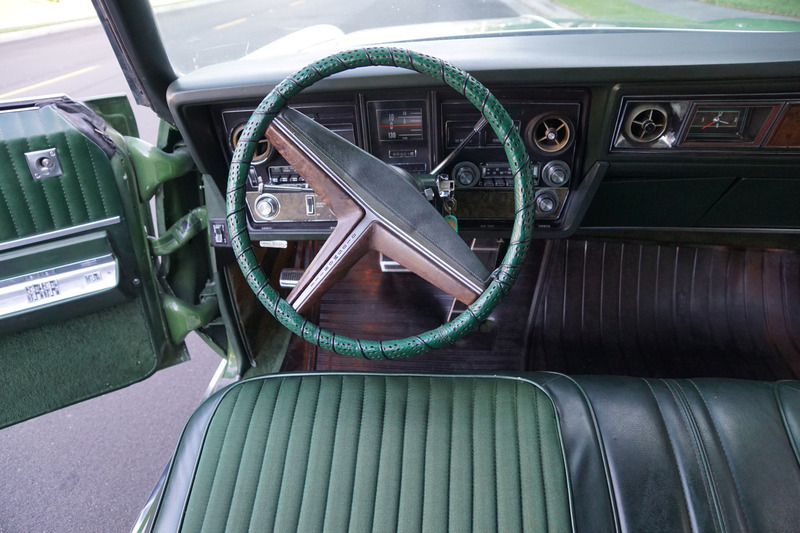 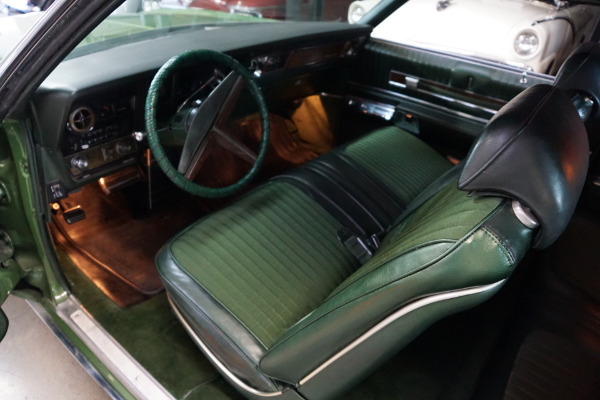 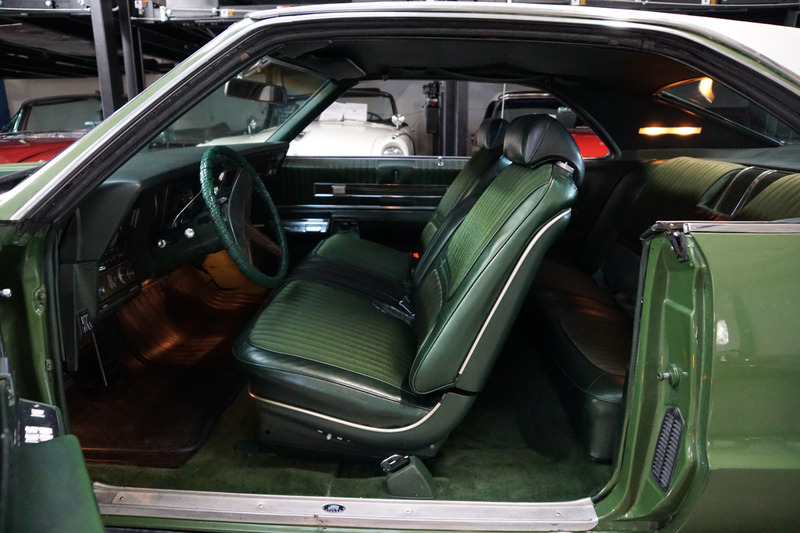 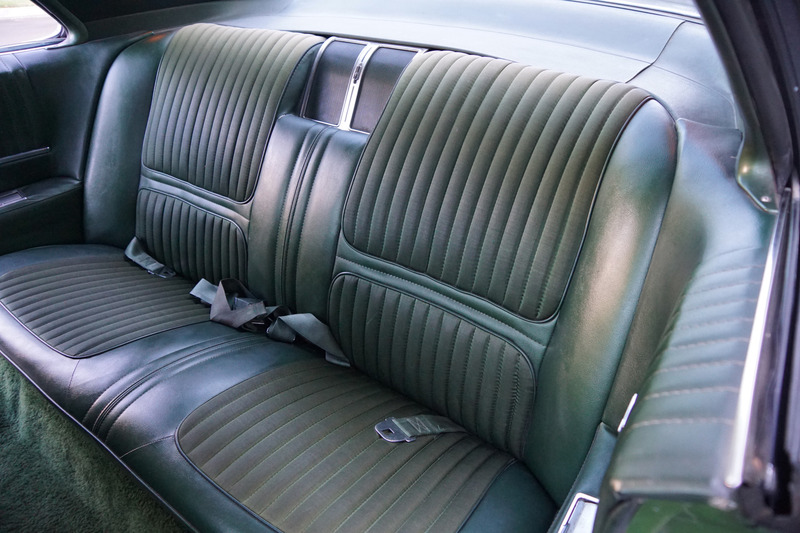 The full width Strato bench seat with center fold-down armrest was also part of the Custom interior package, and was becoming the standard for luxury car seating in 1969. 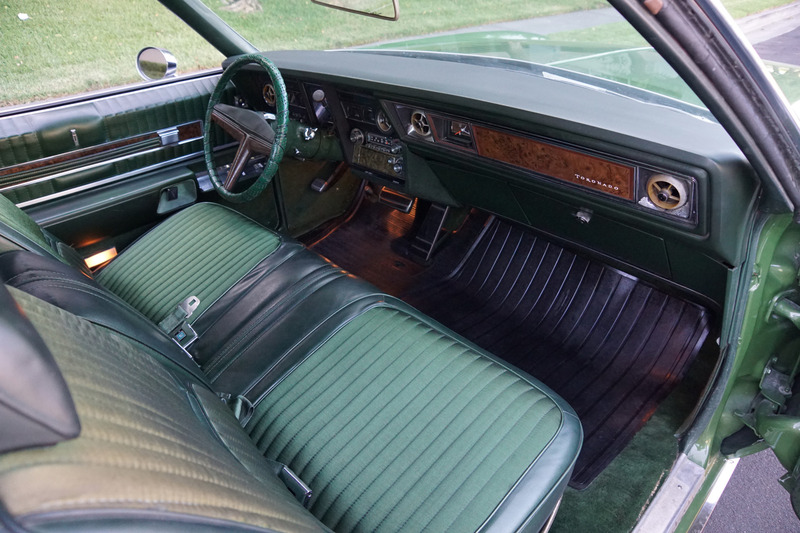 The car was repainted some years ago and presents very well as does the matching interior. 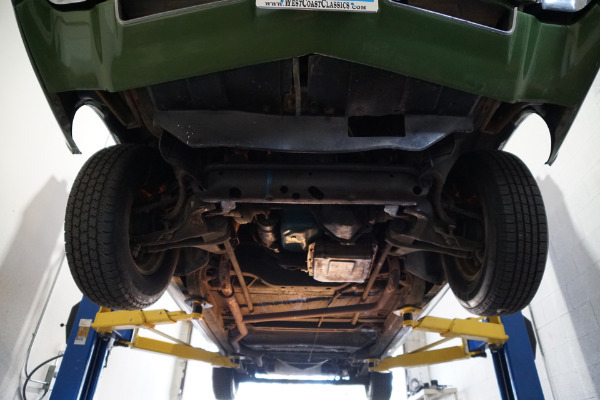 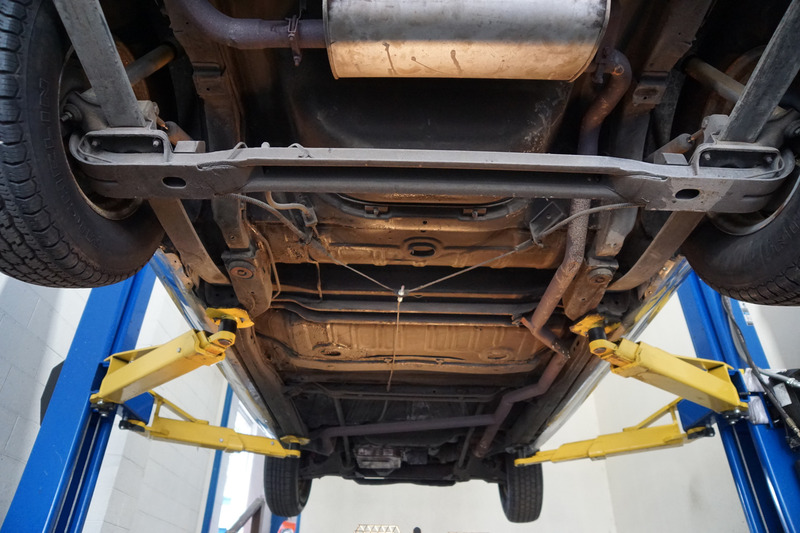 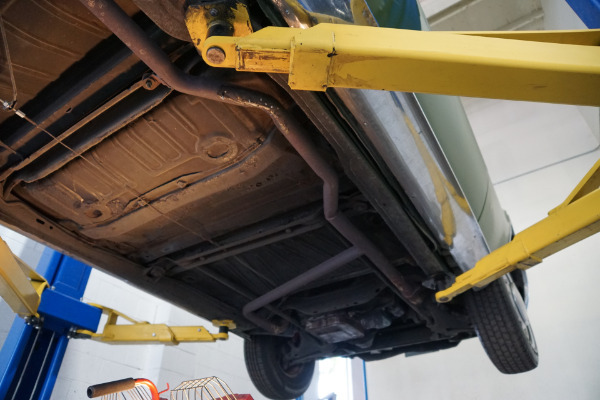 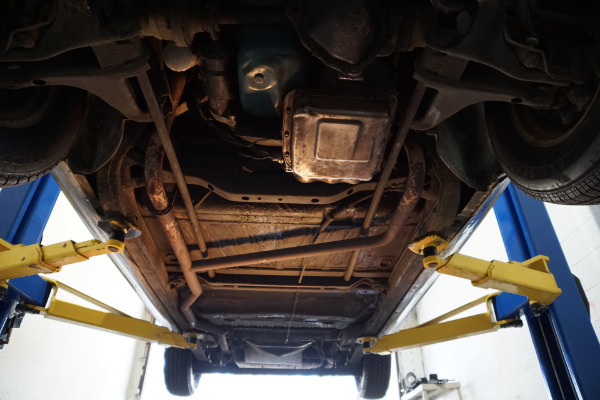 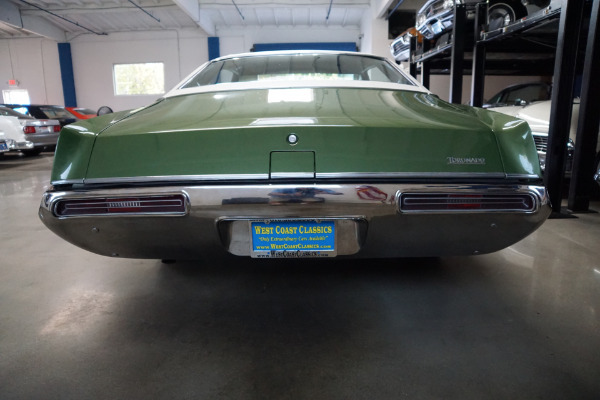 The car drives very well and there are no signs of any accidents or damage but please note that the car does have a Salvage title for reasons we are unaware of. 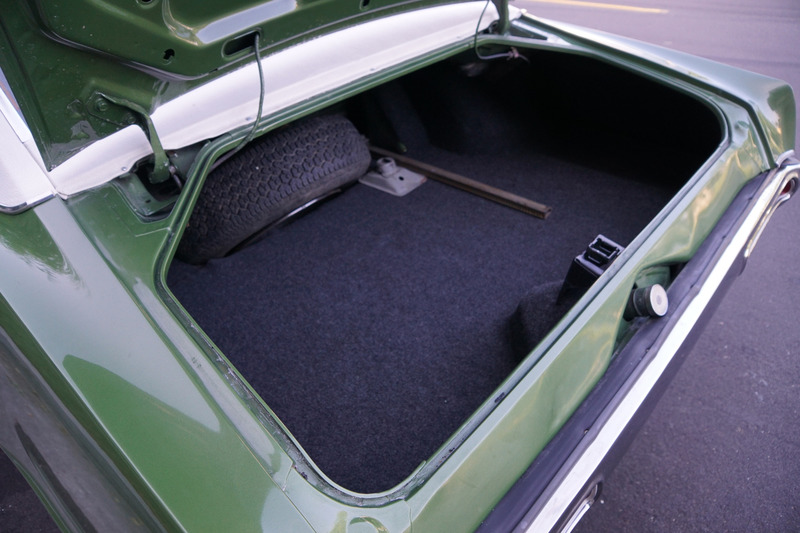 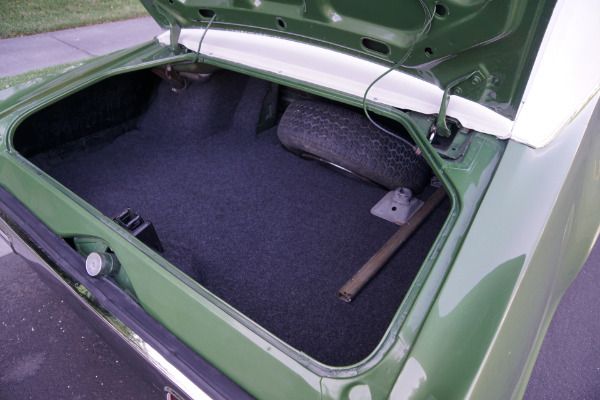 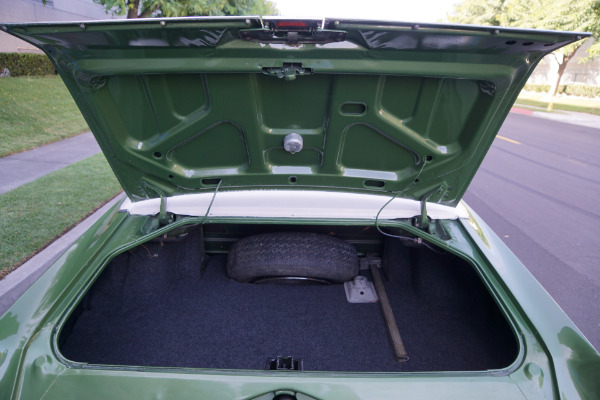 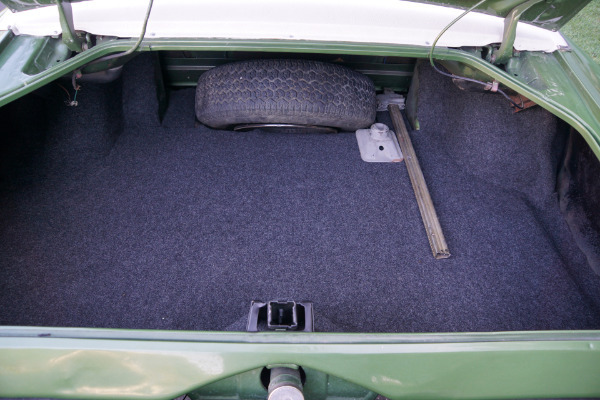 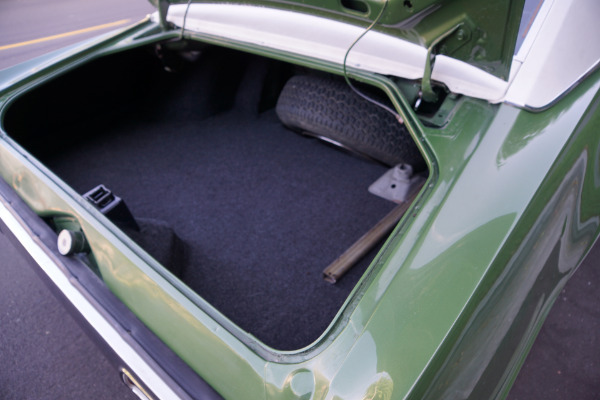 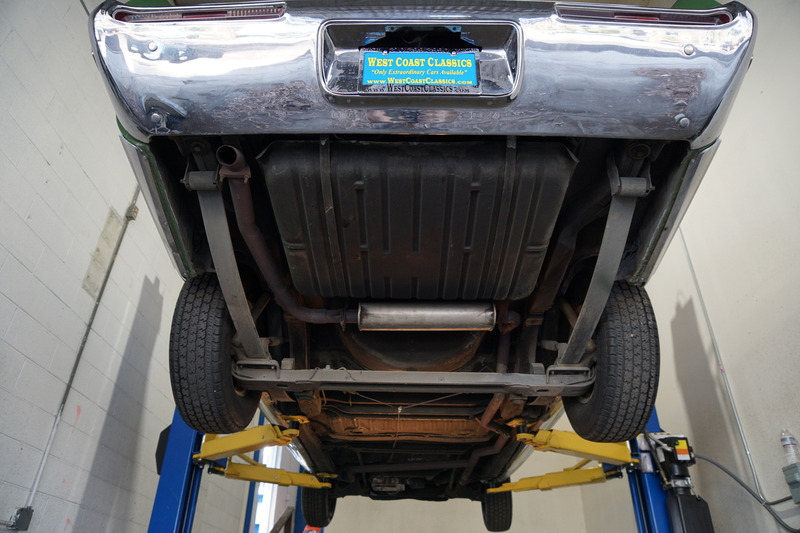 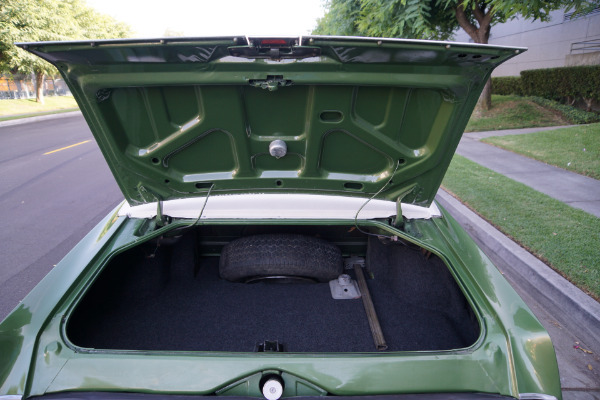 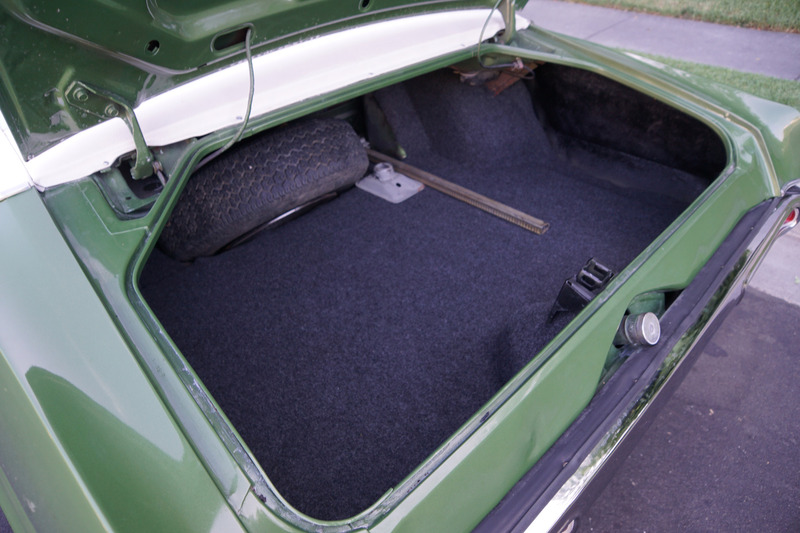 Please also note that the original spare wheel is still located in it's rightfull place in the trunk. 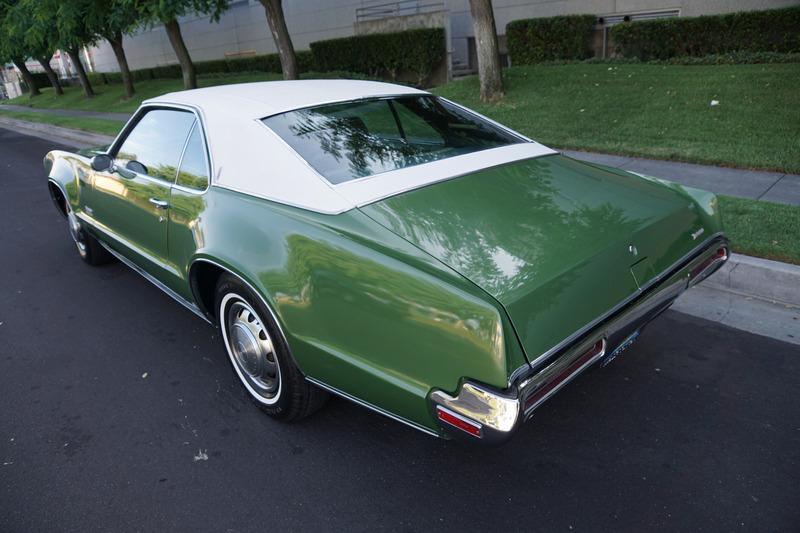 Oldsmobile created the news of the year in 1966 with the introduction of the Toronado, a bold idea combining intriguing exquisite styling with every detail executed by the legendary Bill Mitchell and with sports car performance and which was also the first front wheel drive car (since the mid 30's Cord of which the Toronado would be compared by some) of the modern automotive era. 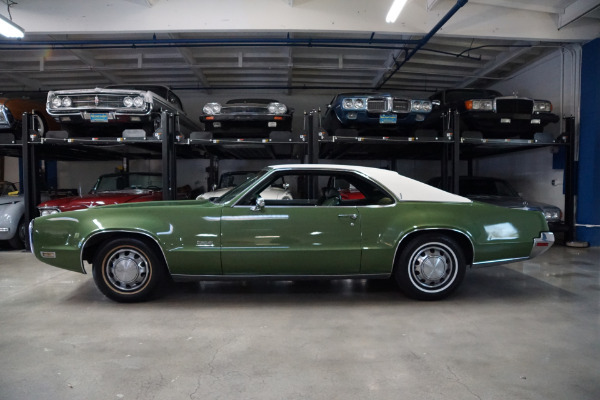 It proved to be one of the most desirable Oldsmobiles ever produced. 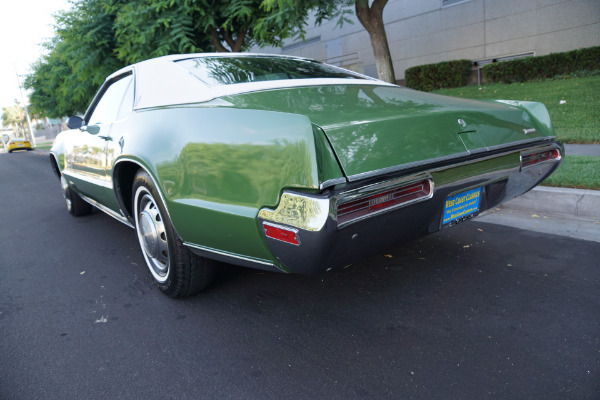 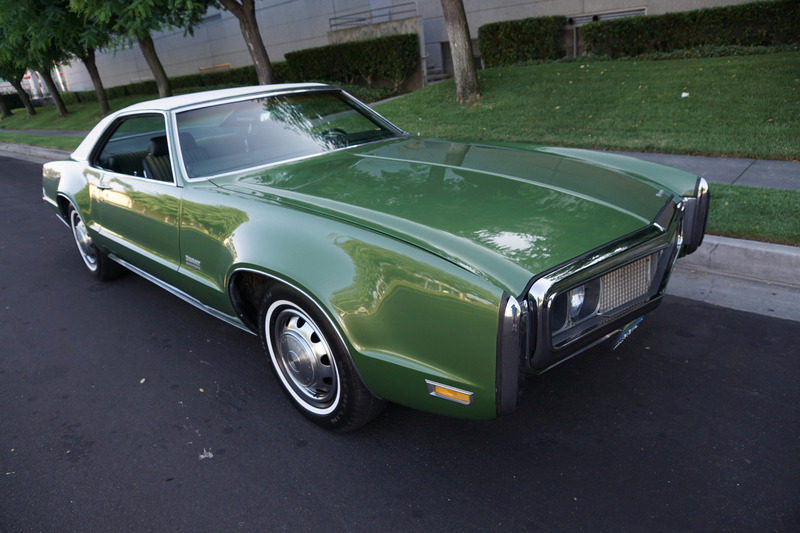 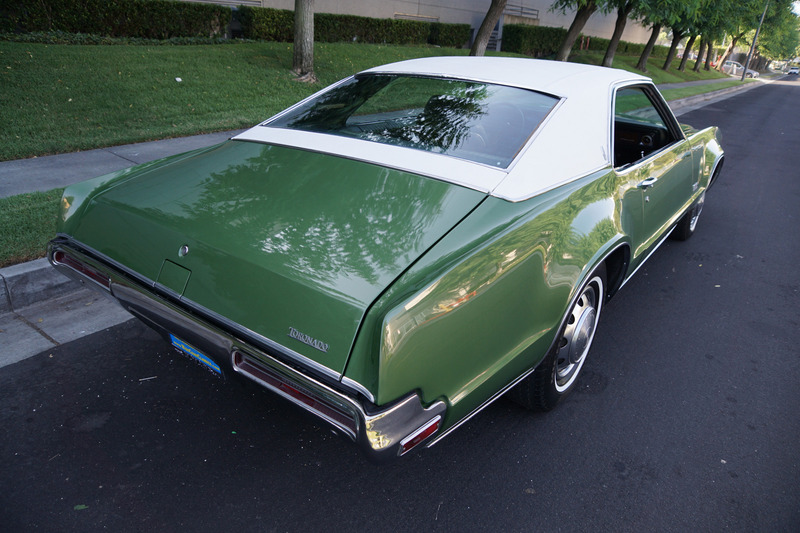 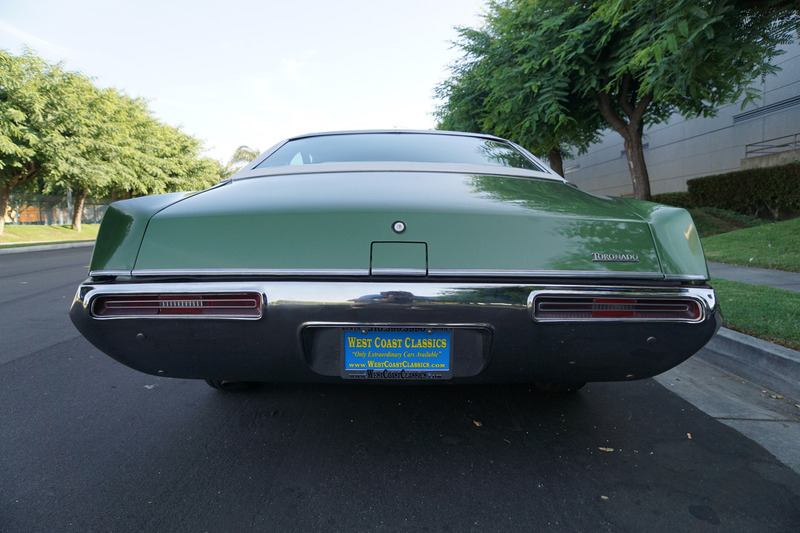 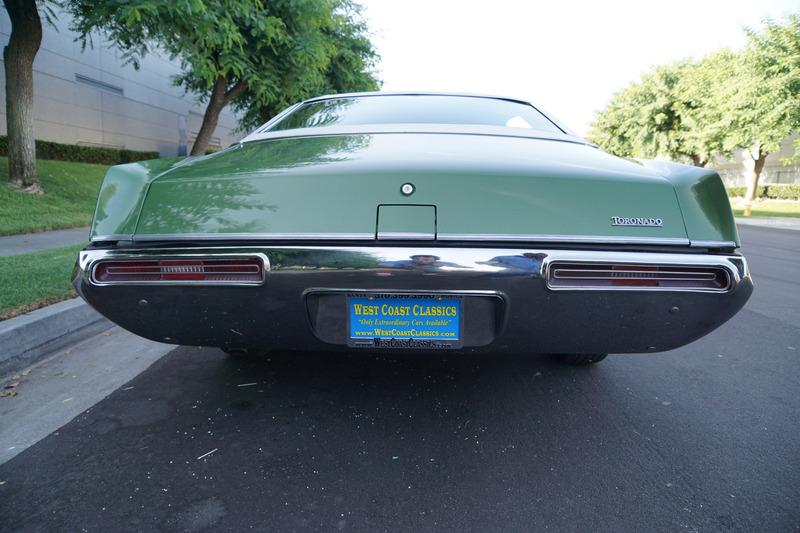 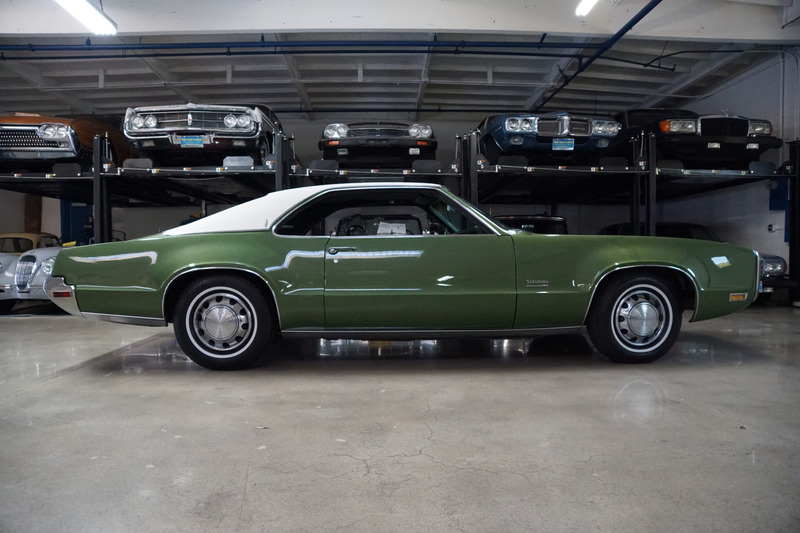 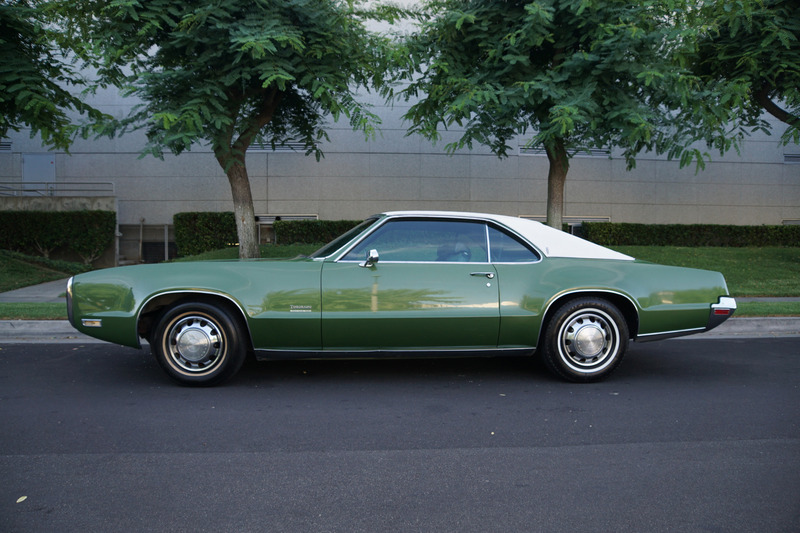 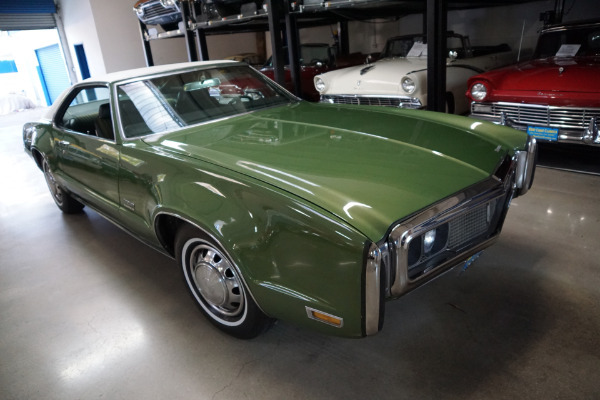 The Toronado was a full-size luxury sport car with a look unlike any other car on the road at the time, jutting front fenders, hidden headlamps, muscularly flared wheel arches and a cropped tail trailing a smooth fastback roofline makes these first generation models unmistakable even today. It was a very large 2 Door Hardtop model distinguished by large rounded wheel cut outs, a sloping fastback roofline, a full-width grille with hidden headlights mounted between the grille and the hood line. 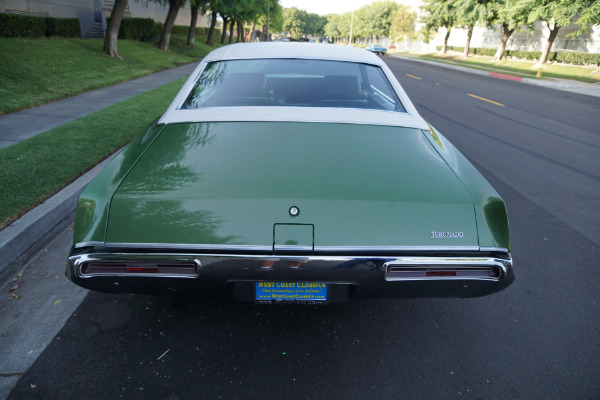 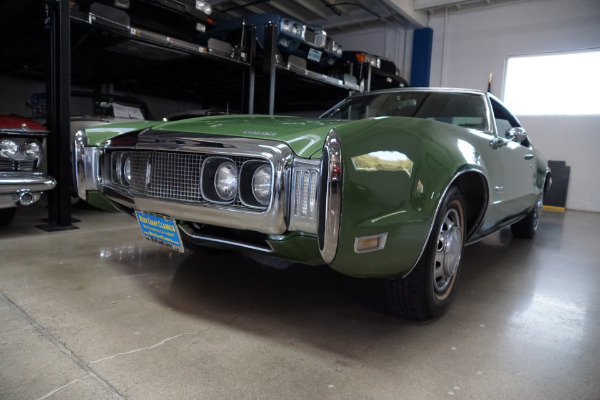 The first generation Toronado (1966-67) had a 425 c.i. 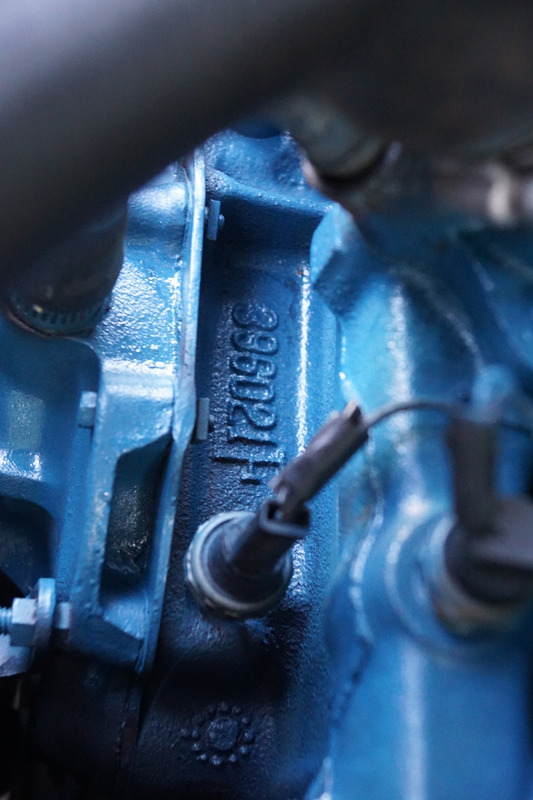 engine that unleashed 385 HP, plenty of horsepower to match any of its competition combined with exceptional traction, handling and performance. 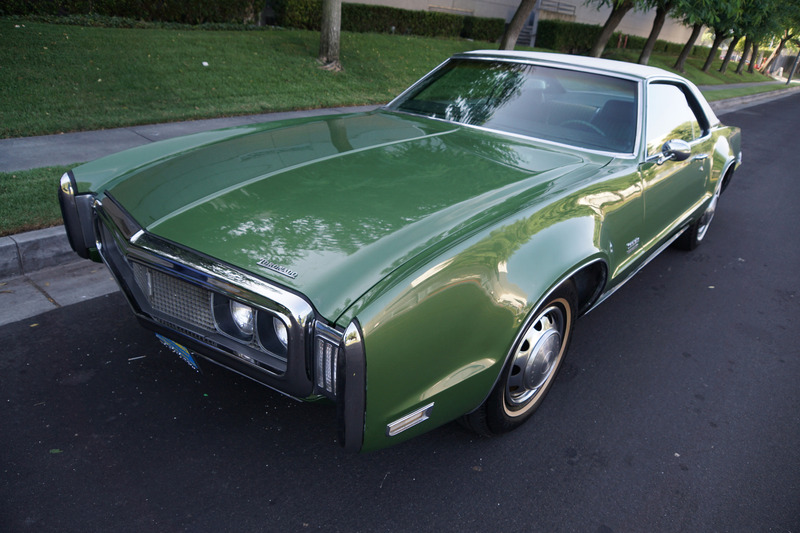 In a bid to fight off it's staid image, Oldsmobile had sought to defy convention when it introduced the Toronado. 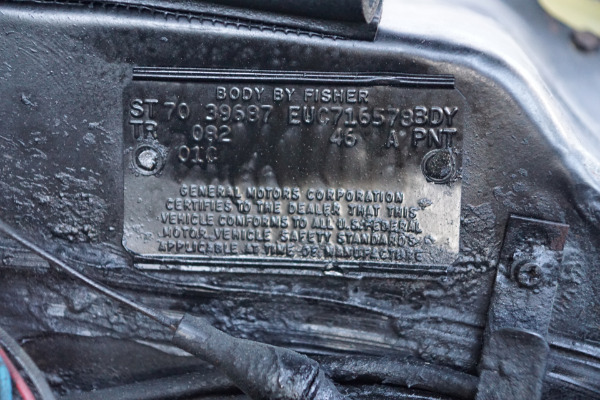 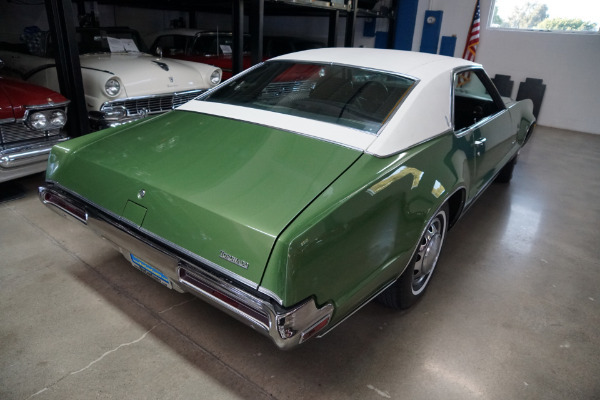 Rather than following the mainstream ideals of creating a muscle car by simply dropping a huge V8 into an exisiting bodyshell, GM's most traditional brand had chosen to turn the rulebook on it's head. The new looks were one thing but the engineering was something else with an enormous 7.4 liter (454 c.i.) 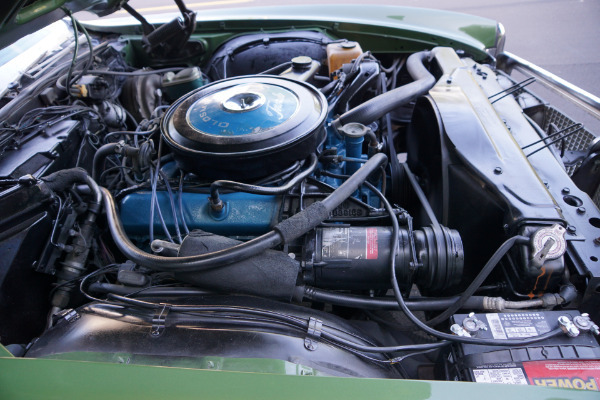 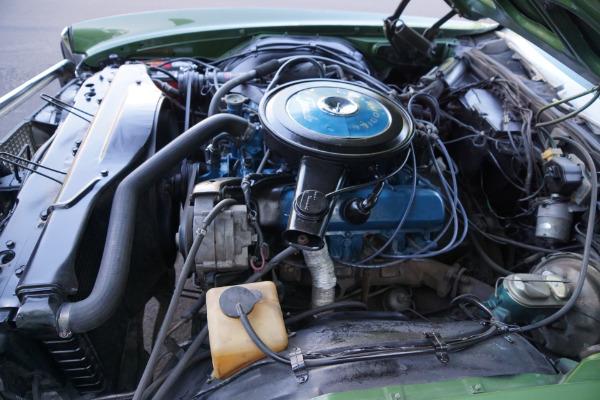 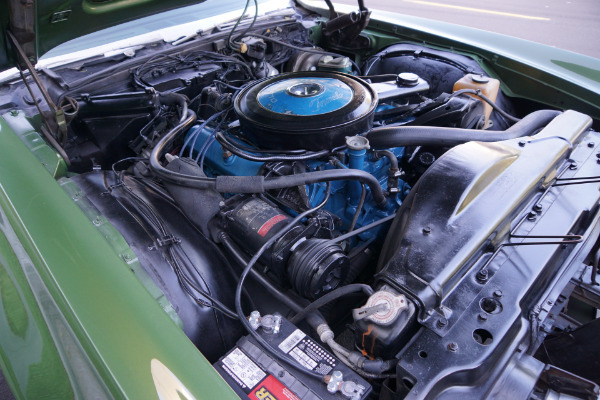 big block V8 engine making for startling performance and it's unique front wheel drive technology, it would prove to be one of the most interesting US car's of its era which would have a huge influence on future car designs. 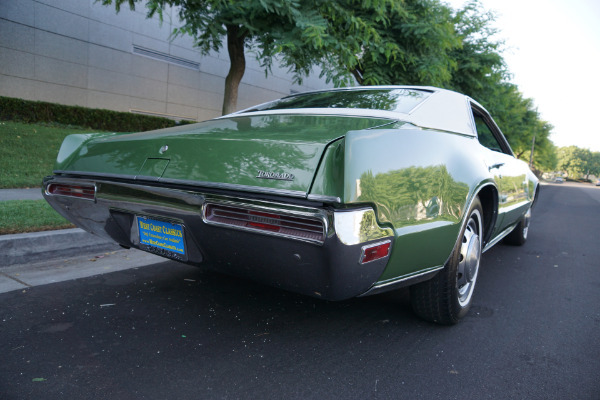 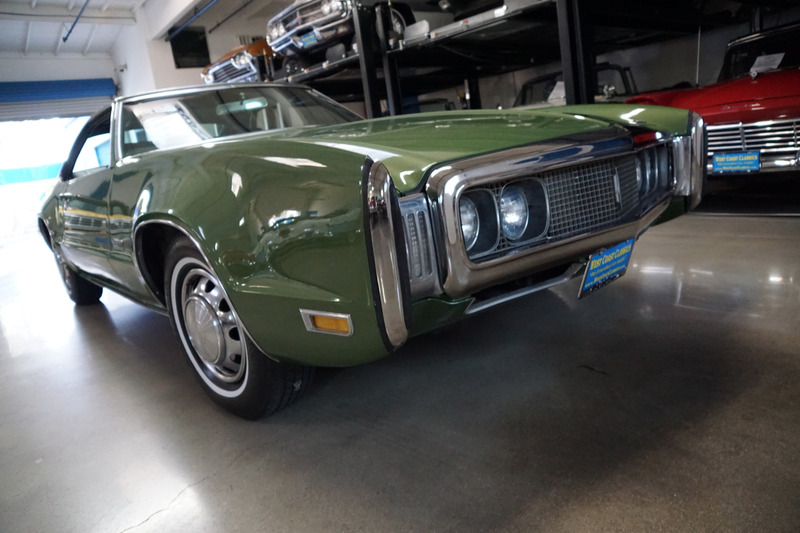 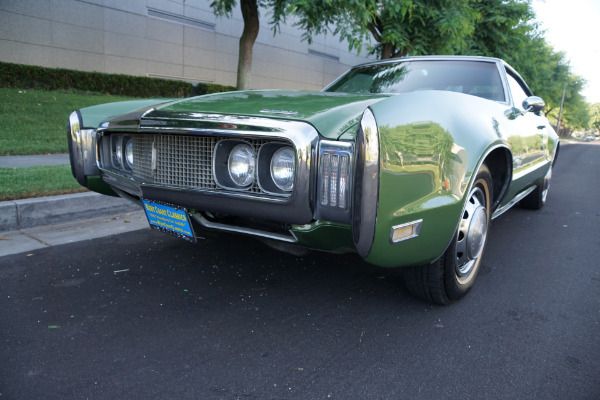 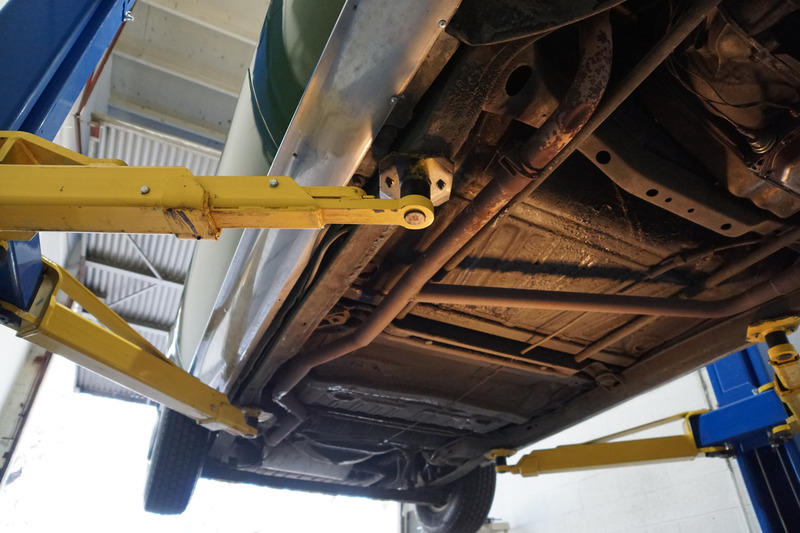 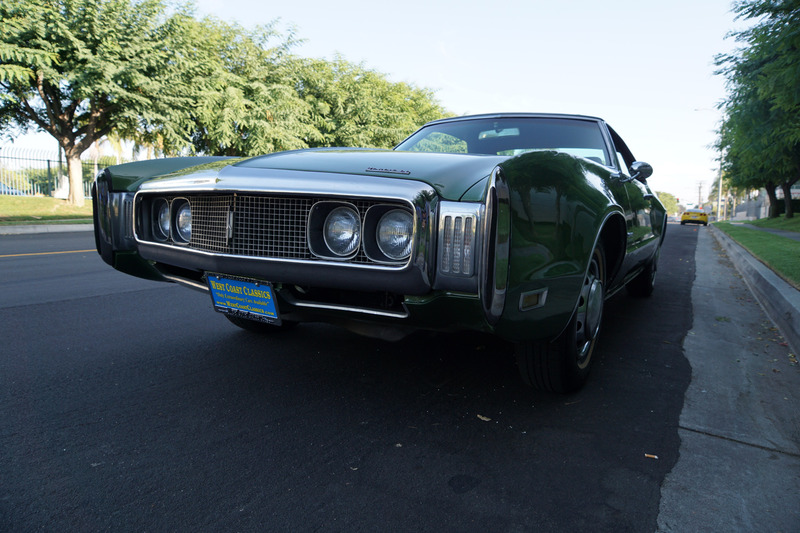 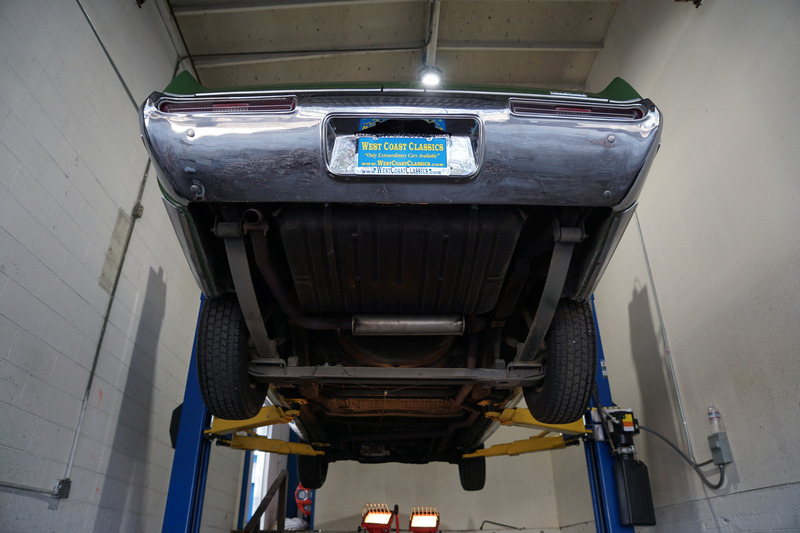 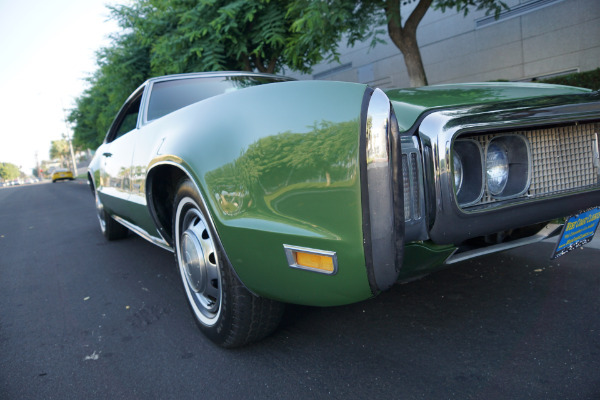 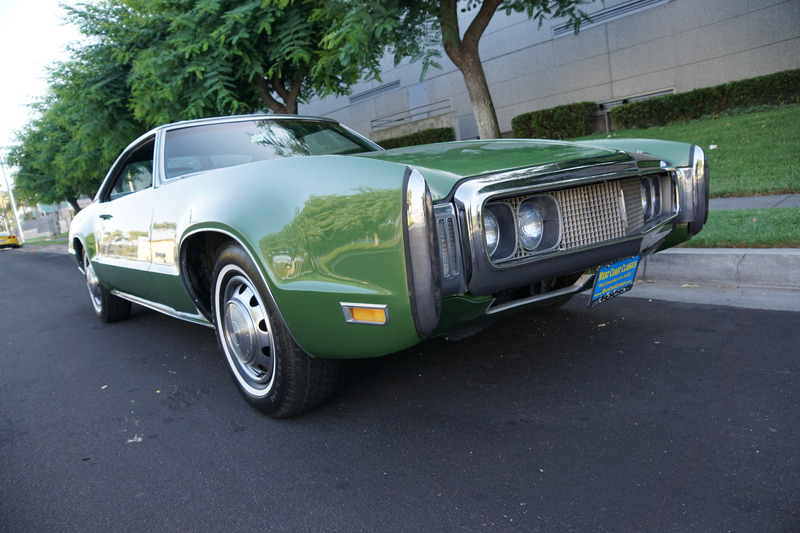 The technology used in the Toronado, along with its ride and handling achievements garnered the Toronado the prestigious 1966 'Motor Trend' magazine 'Car of the Year' award! 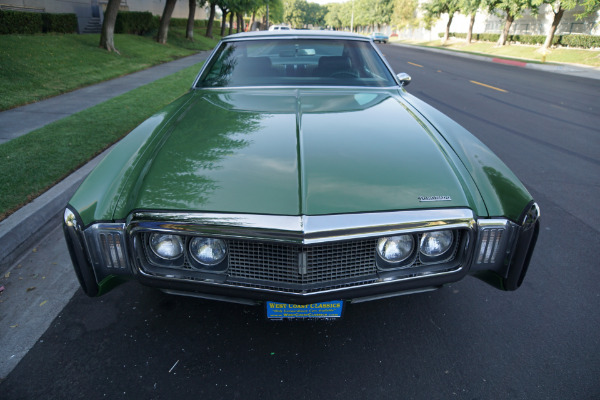 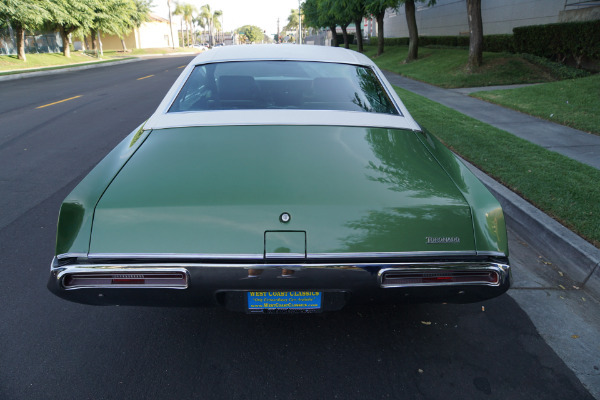 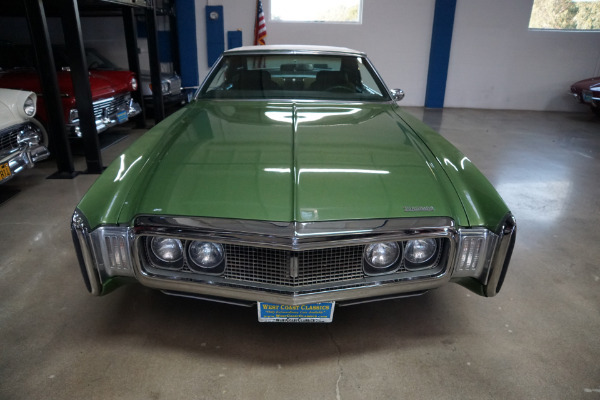 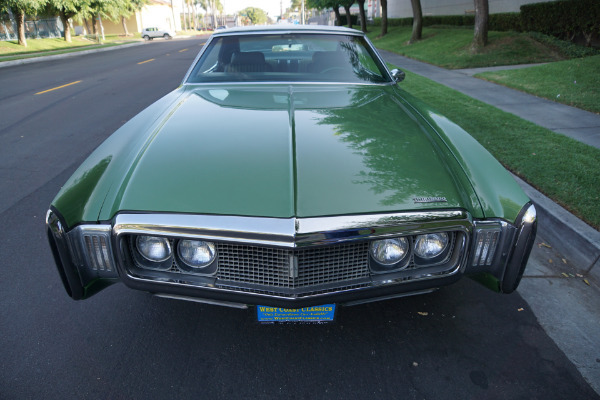 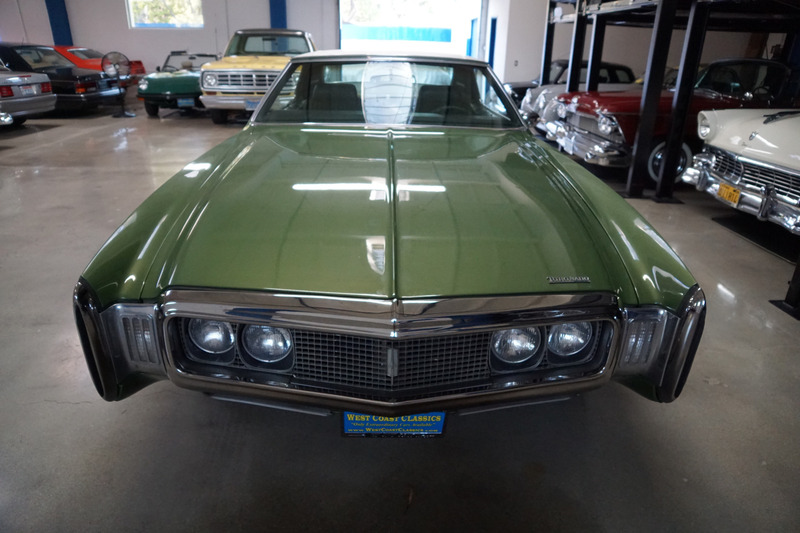 By 1967 every model in the Oldsmobile line up was to be compared to the Toronado in some respect in the majority of its advertising. 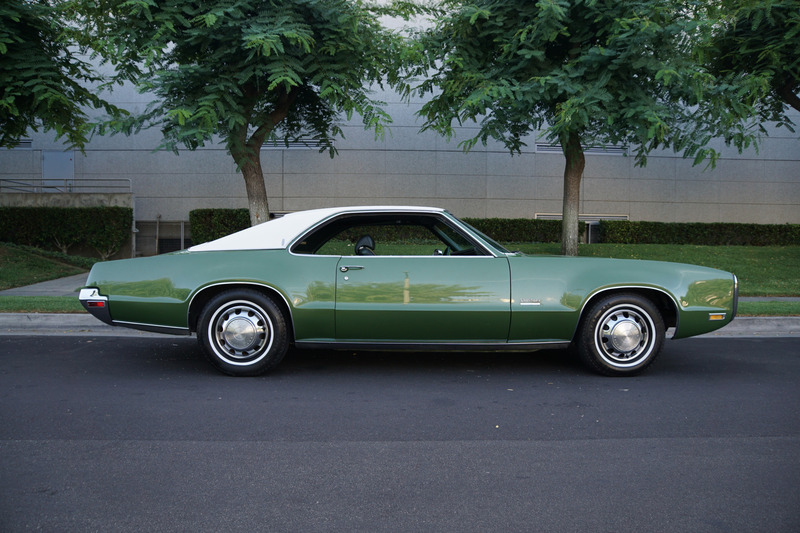 The car received only some very modest restyling with the only major appearance change being to the area round the headlight opening which was now made flush as opposed to the small indented area above the first years model and these first generation Toronado's now boast 'Milestone' status. 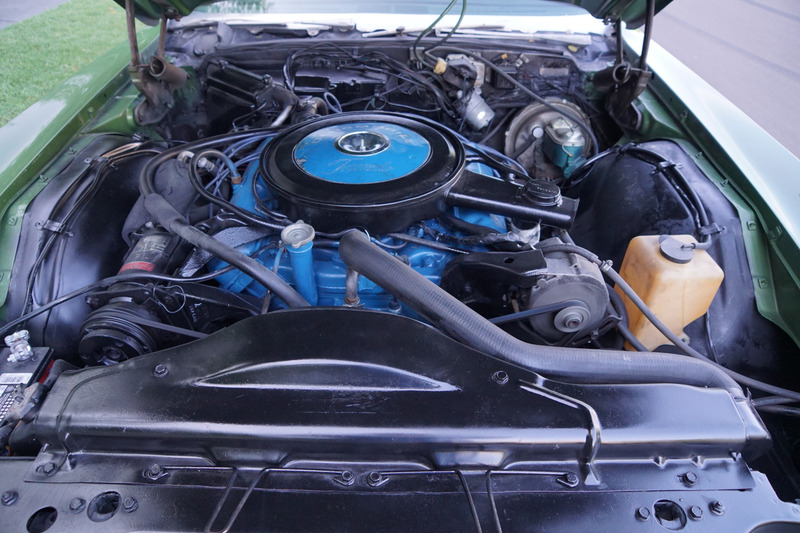 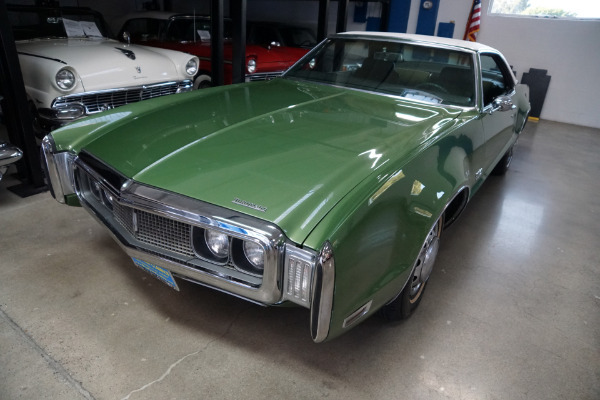 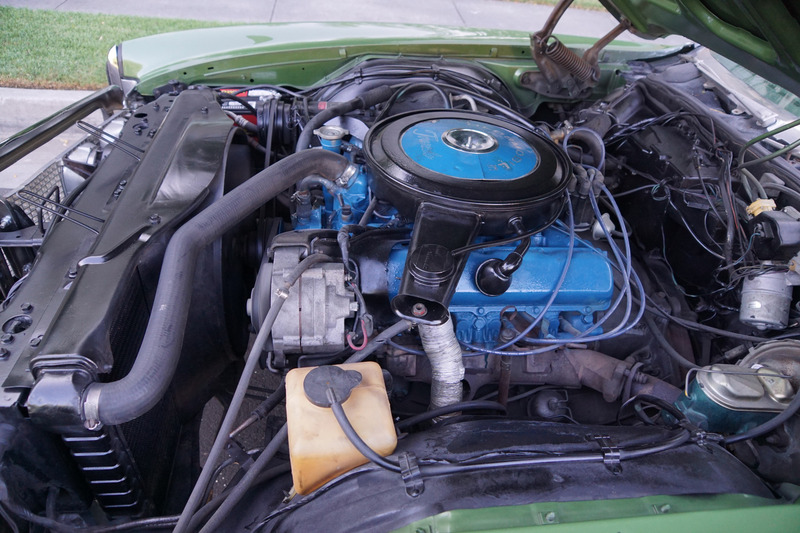 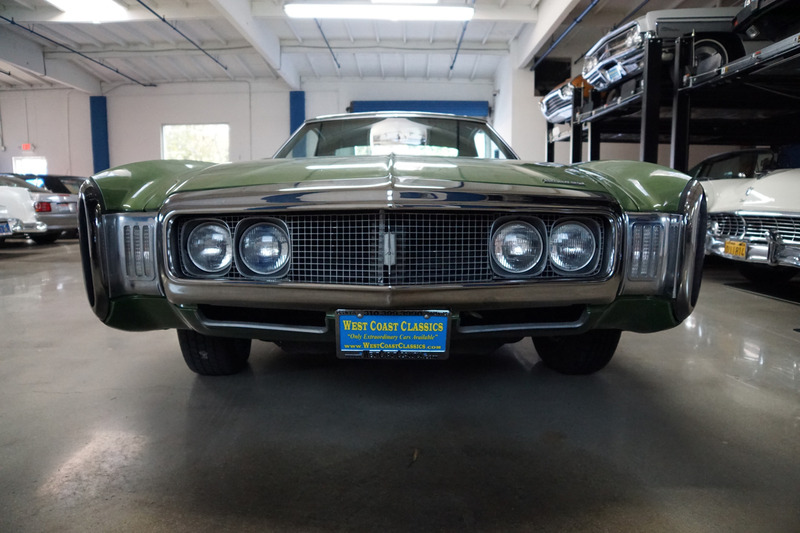 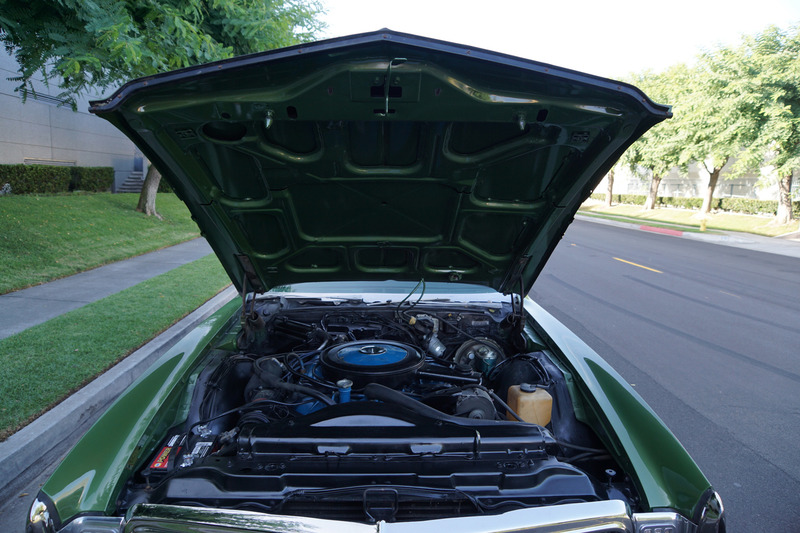 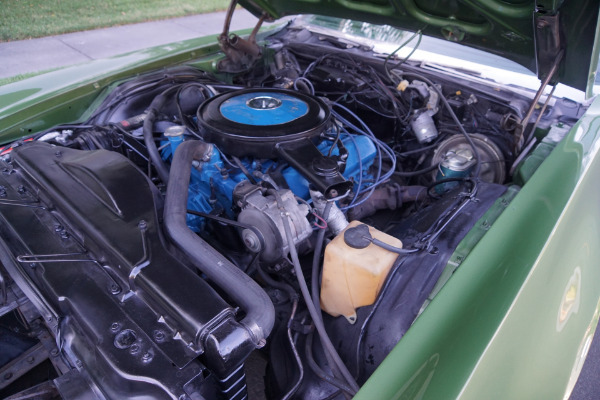 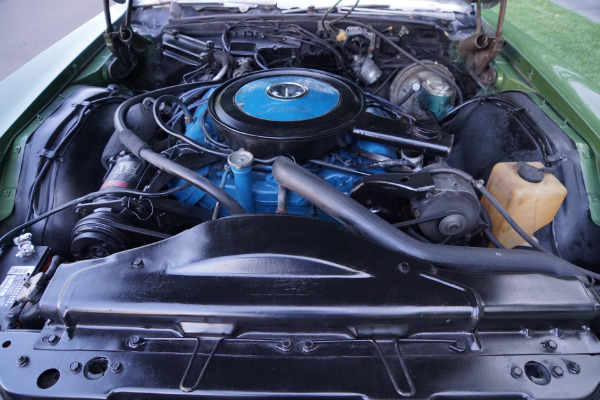 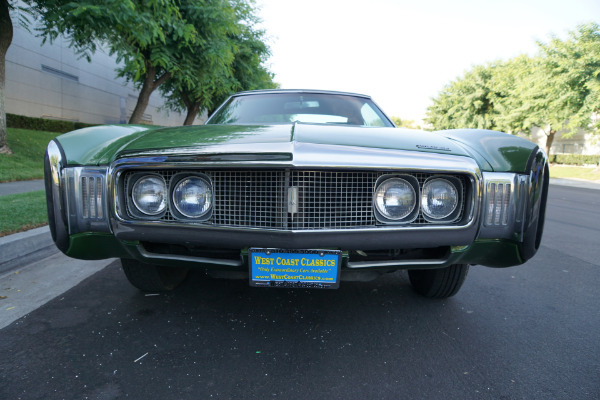 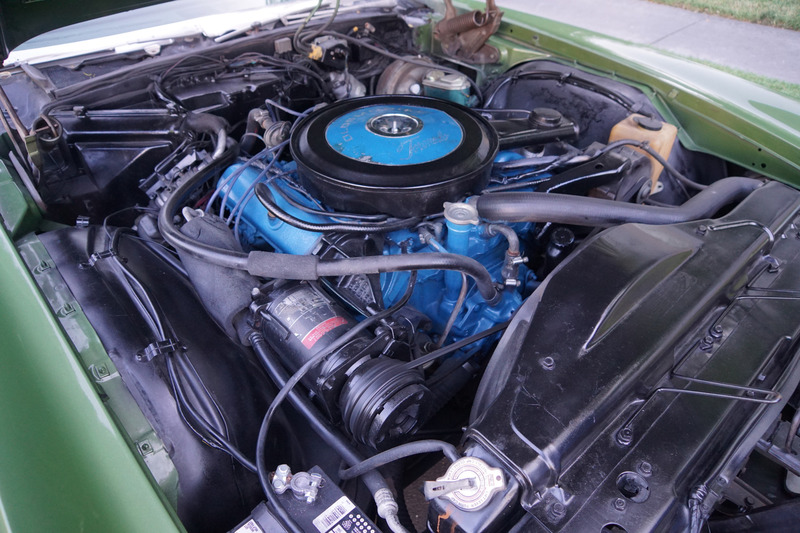 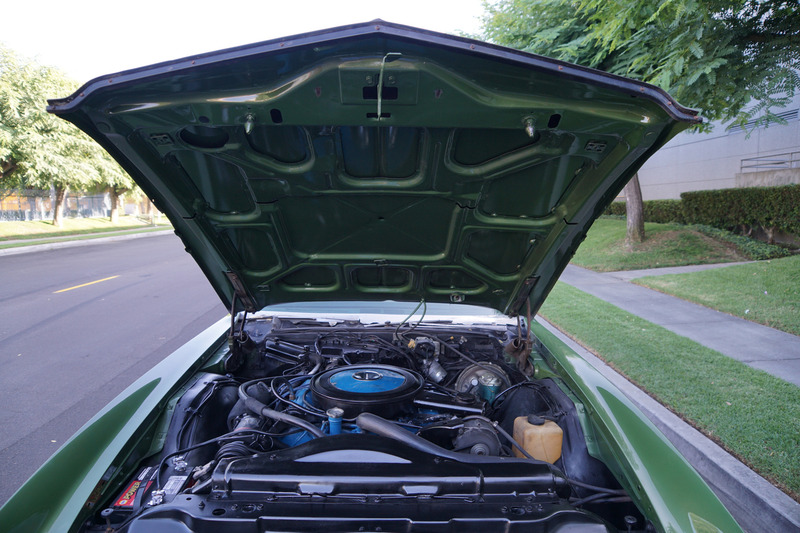 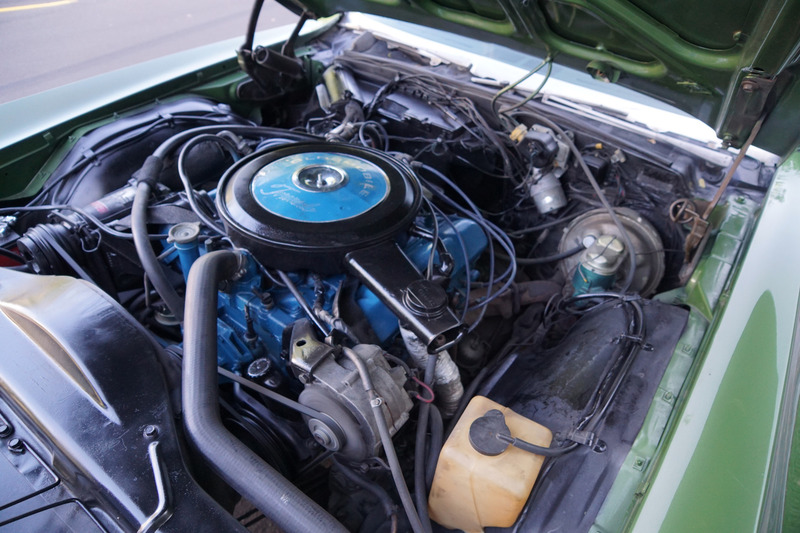 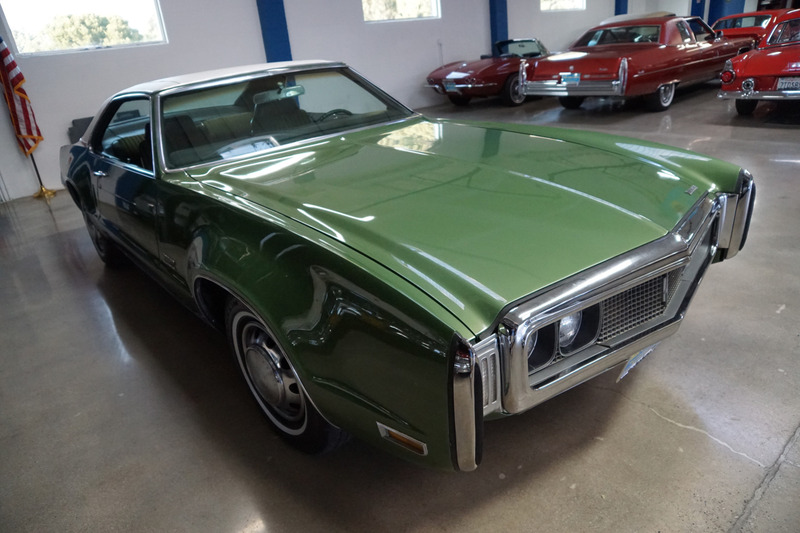 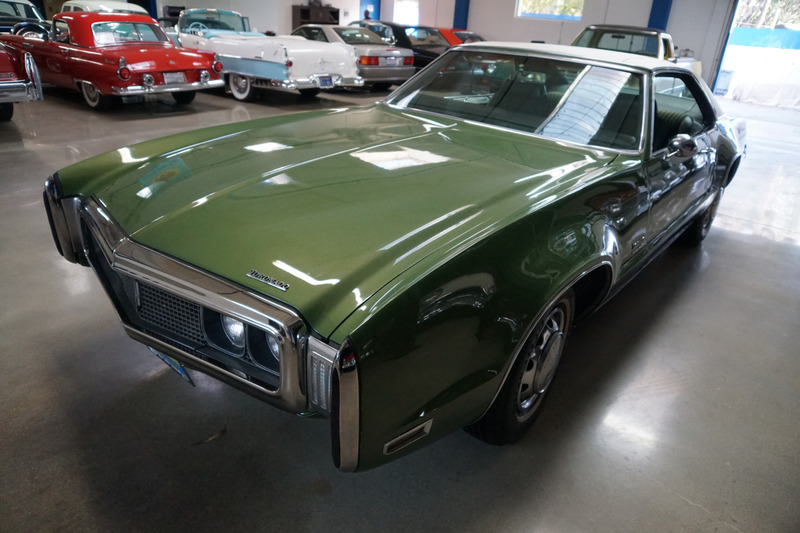 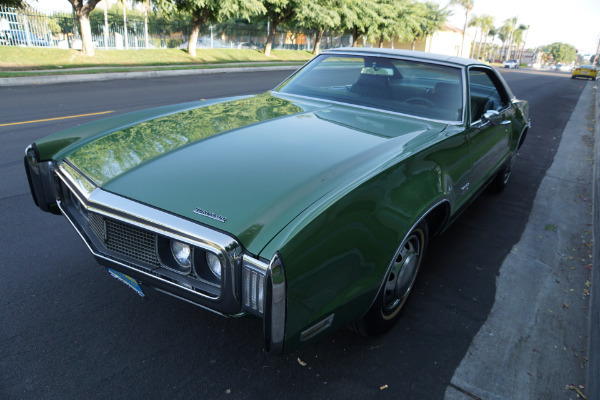 By 1969, the top-of-the-line Oldsmobile had a loyal following and continued as a unique one model only line with only very minimal changes until 1970 when the headlights were exposed for the first time. Sadly in 1971 the Toronado would grow to unbelievable proportions and beyond these years the model is hardly collectible at all. 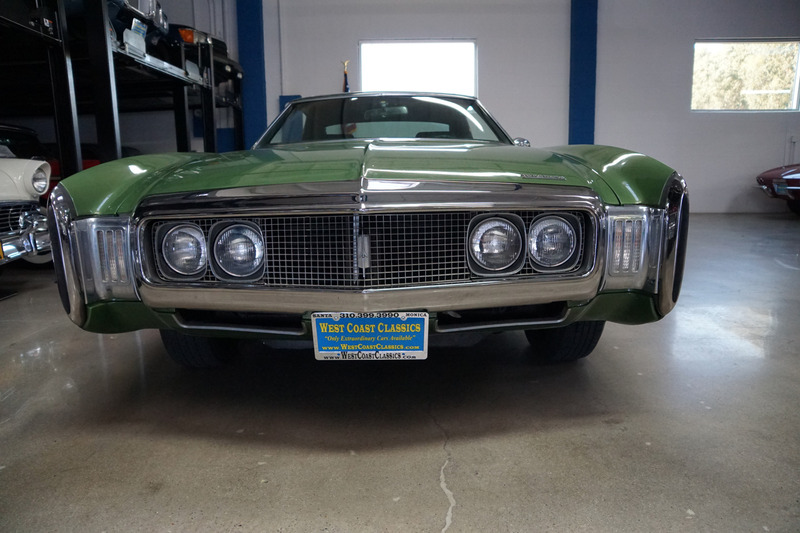 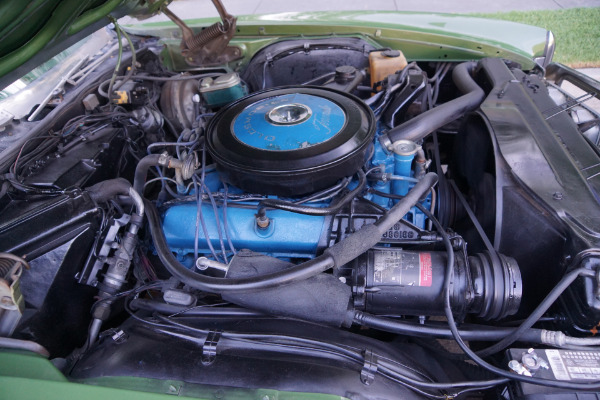 The original 455cid 375HP 4 barrel V8 engine with still correct factory colors is extremely strong and powerful and this particular car drives very well with the automatic transmission shifting smoothly throughout all the gears and the temperature always remaining cool! This is one very rare and highly desirable example of a never abused and very original example of one of the outstanding muscle cars of the sixties, which has high repute amongst American classic muscle car collectors and obviously in particular Oldsmobile enthusiasts for both it's beautiful lines and smooth fast performance for a luxury coupe. 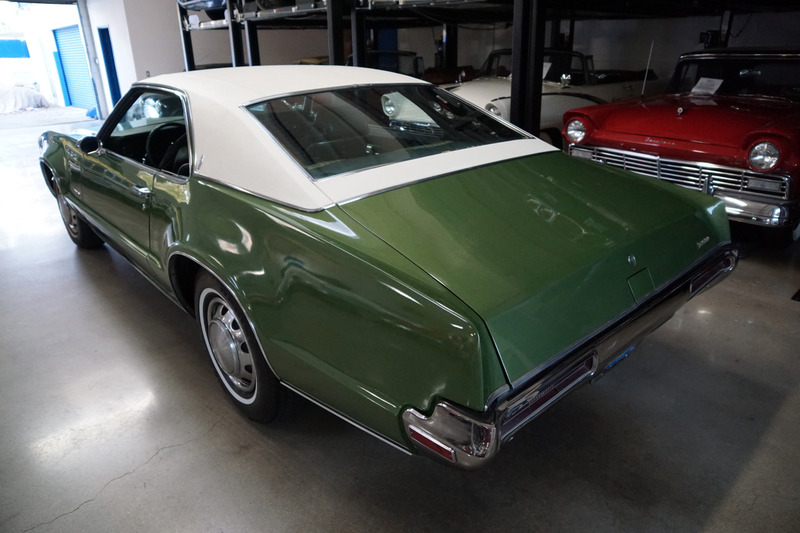 In summary, this is one great opportunity to own a great rust free daily driving example of the second generation (1968-70) Oldsmobile Toronado 2 Door Hardtop ; a very rare model and very striking example of this increasingly collectible marque built for only four years in these most desirable first two generation versions (1966-67 & 1968-70).